So, last week… or was it the week before? I’m getting old… they’re all starting to blur. Anyway… I hit up The Makeup Artist Boutique mid sale and treated myself to a couple of Yaby bits that I’d had my beady eye on. I’ve heard lots of (mostly positive) things about the makeupartist-designed brand and wanted to check it out for myself. 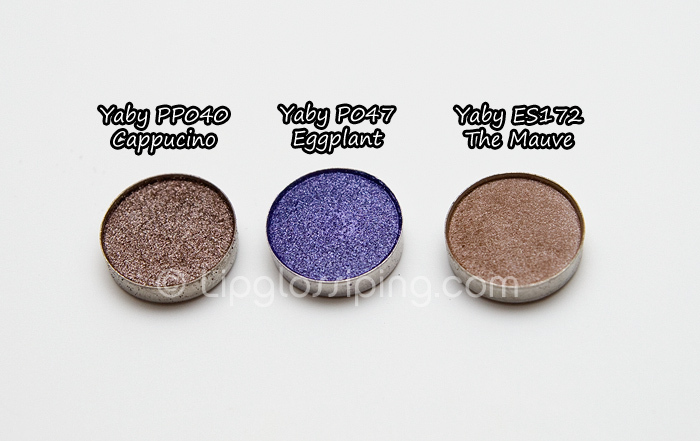 The Pearl Paint eyeshadows (PP040 & PP047) are as creamy as I’d read… really beautiful shimmering shades. I haven’t tried them wet yet, but I know I’m going to like them. I bought the standard eyeshadow as I’d come across recommendations for it on ModelMayhem by quite a few MUAs as a ‘staple’ lid shade. 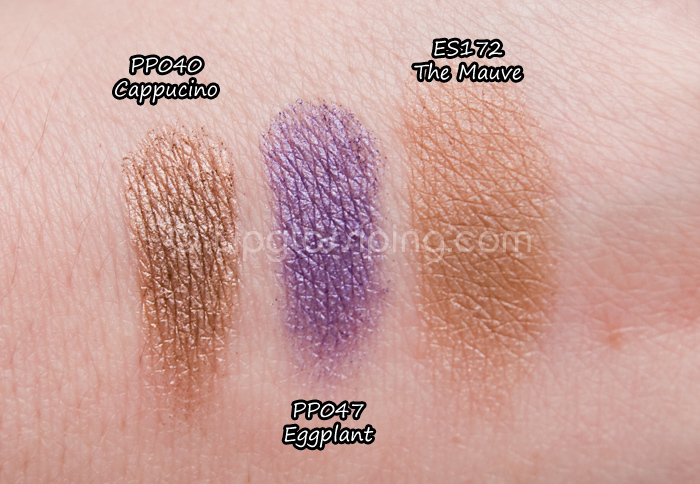 Although it looks kinda boring in the swatch, ES172 (The Mauve – stupid name, it’s not mauve…) is a neutral staple as promised. It’s a lovely matte that looks sophisticated and clean. It applies and blends like butter. Really recommend it! Oh and the pans really are teeny tiny! About the size of a 5p piece. I picked up one of the cream foundations in shade CF013… it’s a little larger than a 50p piece and is a very pale shade that leans slightly towards cool/pink tones. It’s a touch pale for me… but will do until we get nearer the Summer. Actually, it won’t really ‘do’… ‘cos I don’t like it very much. For a cream foundation I find it pretty drying. 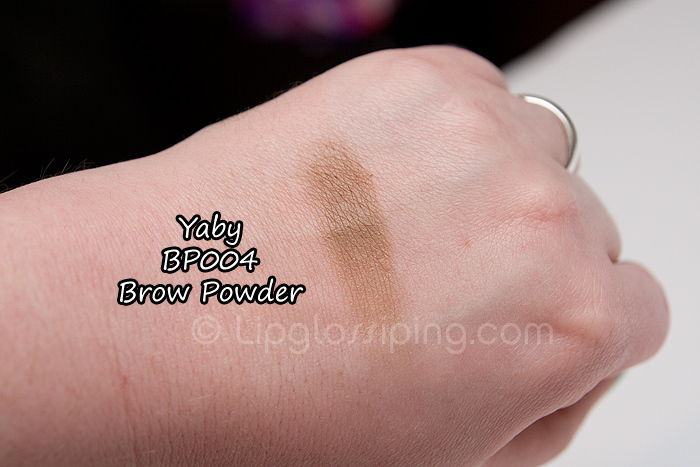 It accentuates dry patches on my skin and despite being creamy, I’m finding it tough to blend. It offers fairly full-on coverage and I’m gonna give it a go with my foundation-saving Beauty Blender. 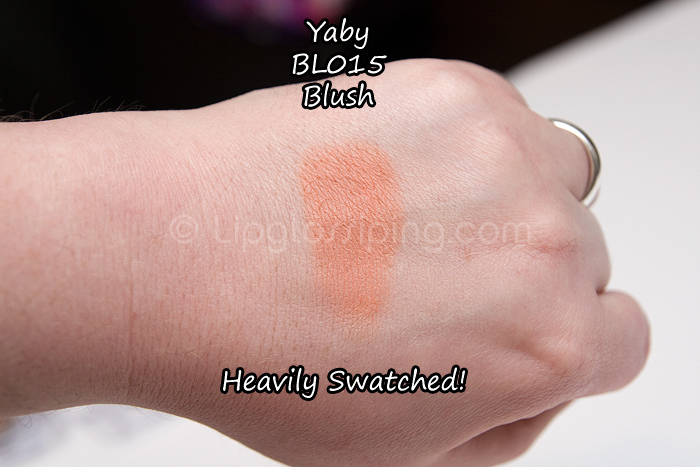 I picked up the Yaby BL015 blush after reading that it made a great shade for pale ladies who usually struggle with peach blush. They weren’t wrong! 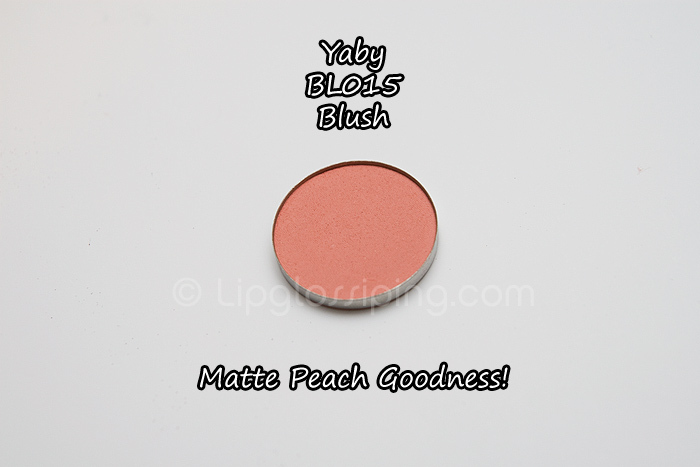 I love this blush… it’s a beautiful true peach that doesn’t turn orange on my cheeks. It’s a subtle flush of matte colour and I’ve been looking for something like this forever. I will buy this again and again! Please note, this is heavily swatched! I was worried about the flash washing out the colour… I just can’t recommend this shade enough. If I weren’t too lazy to do monthly favourites, this would totally be in April’s. I joked on Twitter the other night that this was the most boring looking product I’ve seen in years. It is! Look at it… poo in a pan. 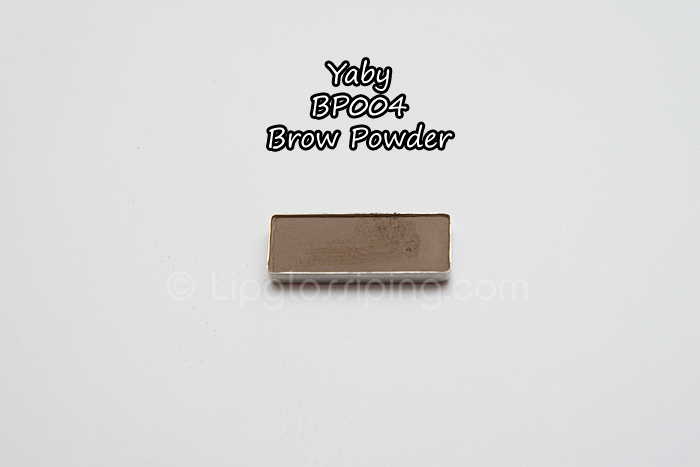 It is however an entirely useful brow powder in a medium brown (slightly ashy) shade numbered BP004. I’m starting to learn that I don’t need to darken my brows all the time. It’s ok to embrace their natural mousey colour and just fill in the sparse bits. So that was my Yaby haul! If I was a half decent blogger I’d price all those bits for you as I went, but it’s late and I’m tired… so you’ll have to have a nosey on site for yourself, sorry. Of course, whilst browsing I had to pick up some more OCC Lip Tars too didn’t I? I haven’t shown you my blossoming Lip Tar collection have I? Do you want to see or are you all Lip Tarred out now? Agree: fancy calling that brown shade ‘mauve’. pff! such good news to know you can buy the yabi individually. where are you going to store them though? they are ever so small. >>> I will definitely buy some and from that website. There are definitely improvements to be made on the website, and on the original canadian website. The colours are all mixed together and you need to flick through pages and pages of shadows and it makes tedious. I think they should have section like ‘the greens and blues’ or the ‘neutrals’ etc so that you can see a bunch of similar colours together and can compare and pick your favourites. This is as tedious as looking for nyx and stila shadows, cos you need to research a lot for real pictures and not just a dot of sterile & lifeless ‘computer colour’. Gee, this what frustrates me the most: surely we should not have to rely on beauty bloggers and youtubers to see what the shades look like, right? Say and Think what you want about ‘doo dee re’ (the unicorn girl) whose a lot of drama has been about, but her pictures of how the shadows actually look like on the lid to be used on the website: wow! I have 2 liptars and I want more! I’d love to see what you’ve got. I’m really interested in mixing them and making new colours! Did you get one of the Yaby palettes to put them in? I love my Pearl Paints, haven’t tried any of the face stuff yet though. I remember seeing the brow powders at IMATS and thinking there were none ashy enough for me. From your swatch i think I need to go cooler than the one you got. Hmmm. I heard a lot about Yaby palettes for a bit but I went with the cheap 88 instead and have been pretty happy with it. I love the look of their bright pre set palette, but $120! Yikes… I think their prices are a bit steep for what you really get.